For some time I’ve been using Insights Discovery Personal Profiling to help my clients develop the talent of their teams. The origins of personality theory can be traced back to the 5th century BC, when Hippocrates identified four distinct energies exhibited by different people. The Insights Discovery model is built around the theory of personality first identified by Carl Jung, in his book Psychological Types, published in 1921. His work on personality and preferences has since been adopted as the seminal work in understanding ourselves and the way we can adapt our behavior, to connect better with other people. I use this model in my leadership and team development work regularly, but it is with sales people that I love to see the breakthrough in their approach to customers. Quite simply, it boosts sales growth! How does it do this? The profile offers a framework for self-understanding and development. Research suggests that a good understanding of self (both strengths and weaknesses) allows individuals to develop effective strategies for interaction. Since interaction and building relationships are such important parts of the sales process, when a sales person fully understands their own personality, they will find it easier to understand the personality of a sales prospect and be able to adapt their approach. We all have our own individual mix of Colour Energies, though everyone has a preference. One of the ways in which to identify your own style is to look at how you are on a good day. If on a good day you’re questioning, deliberate, cautious and precise, then you’re a Cool Blue. Demanding, strong-willed and purposeful? That means you’re a Fiery Red. If your good days are about being sociable, dynamic and persuasive, then you’re a Sunshine Yellow. Encouraging, sharing and relaxed? You’re an Earth Green. We all have days (for whatever reason) when we our behavior is not so good. It may not be our intention at all, but our behaviour impacts others, both positively and negatively. The transformation, in a sales team, and in the wider team too, comes when you, and they, understand themselves and can recognize the Colour Energies in their customers. Take some time now to think about your own personality style and help your sales team to do the same. Once they’ve done it, they’ll be able to adapt their sales pitches to suit different prospects, allowing them to connect with them more effectively. They will also be in a better position to spot the buying signals they’re being given by different prospects and avoid objections that might arise from not understanding how a prospect likes to be sold to. We can be trained in how to adapt body language, tone, presentation, telephone and email style. Deeper personal connections smooth the flow of sales and negotiations and builds long term, trusting relationships, with both customers and colleagues. 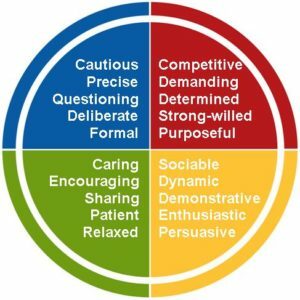 If you’d like to find out exactly how to harness your own personal Colour Energies, to adapt and connect better with your team and your customers, I would like to offer you a free Insights Discovery profile and debrief. This will give you a fully comprehensive report of what makes you tick and how to get the very best out of your strengths. You can use this to start to recognise the styles of your clients and prospects, learn how to connect with them more quickly and win more sales. To complete the online profile and then have a full debrief by phone usually costs £299 +VAT. For readers of Sales Growth Extras I’m currently offering this service completely free – no strings and no catches. If you’d like to understand your personality more fully and increase your sales, then just click here to email me or call me personally on 07740 290 506.